I hit up a Chanel counter tonight and bought Chanel Vamp, and I'm loving how it looks on my nails. I shall take photos of it tomorrow morning. I ventured over to a Dior counter after making my purchase and I looked at the Garden Party collection, which is absolutely stunning. I love the collectible compact but to be honest I don't think they are worth it, at least for me. I already have a ton of eyeshadows and I don't like lip glosses that are in compacts, and none of the colors are something I don't have. However, the nail polishes are awesome! The colors are Forget-Me-Not and Waterlily. 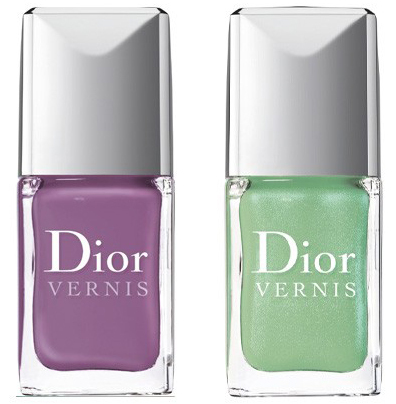 I think I want these to be my first Dior nail polish purchases. They will be so lovely for spring! They are also lightly scented. I tried them out on top of my gold manicure and you can see what they sort of look like on my nail. 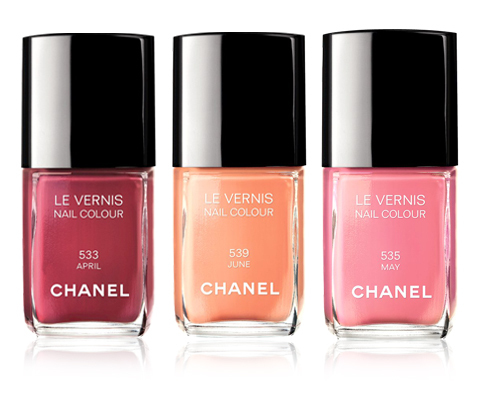 I have also been wanting these three Chanel shades for quite some time. I've been putting off purchasing them because I know they'll still be around, and May and June are very springy so I'd rather get them when it gets warmer. Right now, I have Rouge Fatal, Black Satin, and Particuliere on my wish list. They are all good colors for this weather, I think. For the warmer weather, I want April, May, June, Mimosa, Rose Insolent, and possibly Tendresse. I painted this weird thing tonight, but I don't know what to do with the background. 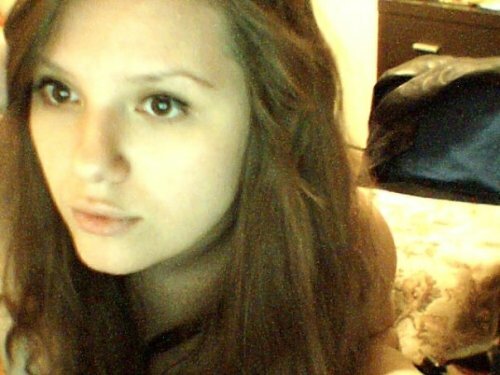 I completely agree with you Yana! I own June and Waterlily so far. I think 'Forget me not' looks a lot like 'Paradoxyl' by Chanel minus the duo chromness lol. I just bought Waterlily two days ago. I haven't worn it yet, I'm loving Deborah Lipmanns polishes! You can never go wrong with Particulere. I love it! I don't think Mimosa is sold anymore at the Chanel counters, unless you purchase it online. Have you seen the leaked pictures of the Chanel Summer collection! LOVE IT! You can always count on Claudia (theclaudiacouture) or I to post haul videos on the latest collection by Chanel or Dior. I'm desperate to see the Dior collection, I don't think I would buy any of the eye shadows!- Did you see the rosy glow blusher for Dior ? try the DL nailpolishes, im like you, not a fan of OPI but love chanel, the DL's are amazing. how would you compare the dior brush to the chanel? i feel like its more like a makeup brush than a nailpolish brush..
Ooo,the green Dior polish looks awesome! I would also love to wear Chanel's June polish.